I still didn’t believe him as I started to read but the story slowly pulled me in and when I finally finished it, I realized he was absolutely right. I felt great about my life and I was forever grateful to him for insisting I read this incredible true story. Billy Hayes is, for all intensive purposes, an average guy who did something stupid. He boarded a plane in 1970 with marijuana and was caught. To make matters worse, this happened in a foreign country and he was sentenced to four years and two months in a Turkish prison. This is not a story about drugs or foreign agents. What should have ended as a textbook case was later extended to a life sentence against any form of reasonable judgement. Hayes found himself struggling for his life until he managed to plan an escape in 1975 to Greece. His story is an ordeal of what it means to lose everything you have and then get it back again. This is an extraordinary story that simply can’t be done justice in a book review or by watching the subsequent film which was released in 1978. The film was directed by Alan Parker with a screenplay by Oliver Stone but the movie differs from Hayes’ real-life experiences and is simply not as emotional when it is shown on the screen. Hayes was also extremely angry over the film adaptation because he was not fairly consulted about it and much of the story was changed. Hayes especially expressed his disappointment with the films portrayal of “all Turks as bad” and regretted that Turkey’s image was negatively impacted by the film. He returned to Turkey years later to attend the 2nd Istanbul Conference on Democracy and Global Security to amend the negative implications of the film that were not expressed in the book. He held a press conference on the 15th of June and made an apology to the Turkish people. Nonetheless, apart from the political portrayals, Hayes did indeed encounter many terrible experiences in prison and an injustice which is certainly the subject of a great story. This is a reason to truly appreciate your own life after you read it and to thank God you have so many things that you take for granted. If you want to turn over a new leaf and you need something to get you started, this is the book that will do it. 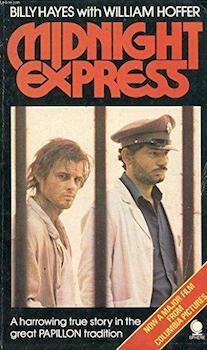 Check out ‘Midnight express’ and be glad you have all the privileges and benefits of a regular free person. If you can’t see that now, you surely will when you are finished. This entry was posted in Recommended and tagged Recommended books. Bookmark the permalink.